DB2 Workload Manager (WLM) introduces a significant evolution in the capabilities available to database administrators for controlling and monitoring executing work within DB2. This new WLM technology is directly incorporated into the DB2 engine infrastructure to allow handling higher volumes with minimal overhead. It is also enabled for tighter integration with external workload management products, such as those provided by AIX WLM. 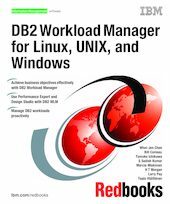 This IBM Redbooks publication discusses the features and functions of DB2 Workload Manager for Linux, UNIX, and Windows. It describes DB2 WLM architecture, components, and WLM-specific SQL statements. It demonstrates installation, WLM methodology for customizing the DB2 WLM environment, new workload monitoring table functions, event monitors, and stored procedures. It provides examples and scenarios using DB2 WLM to manage database activities in DSS and OLTP mixed database systems, so you learn about these advanced workload management capabilities and see how they can be used to explicitly allocate CPU priority, detect and prevent “runaway” queries, and closely monitor database activity in many different ways. Using Data Warehouse Edition Design Studio and DB2 Performance Expert with DB2 WLM is covered. Lastly, the primary differences between Workload Manager and Query Patroller are explained, along with how they interact in DB2 9.5.